That’s good 🙂 I know you’re a seasoned walker! I love the sense of celebration here Sarah in the appearance of the mushroom and people paying attention to it. They do seem miraculous organisms. I know you love mushrooms, Andrea, as quite a few have sprouted on your blog from time to time. Perhaps you can identify this little fellow, as I’m not convinced he’s of the edible kind, even though he’s the same colour as our common mushroom. I think his stalk is too thin. If not, he’s probably poisonous (to humans at least) but nevertheless beautiful and fascinating to look at. 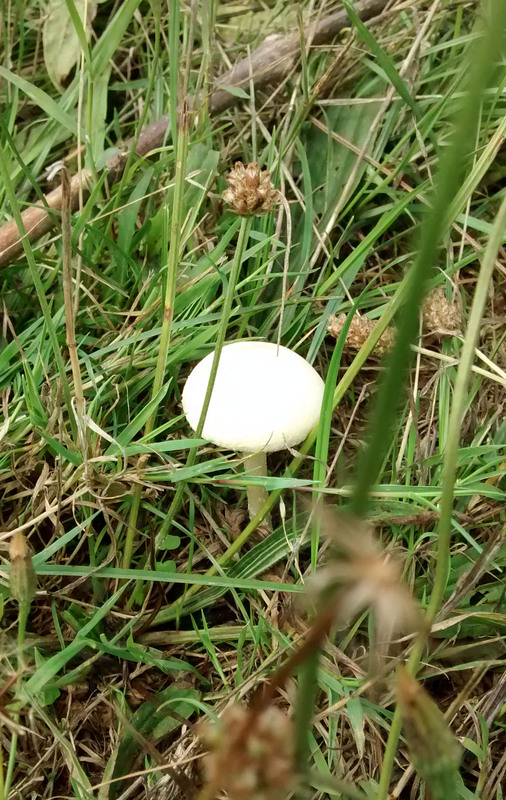 It does look like a field mushroom, but even though I’m sure field mushrooms grow in our park I’d never eat one just in case – fungi can be notoriously difficult to identify! Thank you, Andrew 🙂 Happy Monday to you, too. It did sort of glow, in contrast to a very gloomy and overcast day. I better not say it looked quite magic, or people might get the wrong idea! We have quite a few to admire here, all shapes and colors. 🙂 I always love to start my day with a Sarah haiku….wishing you a spectacular day of living, my dear friend. The one thing I love about the Autumn when it arrives, is walking in the woods and encountering all shapes and sizes of fungi, not that I’m wanting to bring on the Autumn, yet. I’m guessing that you’ve had some rain, too, if all shapes and colours of fungi are thriving in your part of the world. We’ve had plenty, but have now returned to a dry spell for a few days. Out with the watering can again! Wishing you a wonderful week, my dear friend (am behind with blog visiting — over to yours tomorrow or Wednesday for a catch-up, hopefully). Yes, I too am overwhelmed and out of routine, but not with as many stress factors to contend with as you have. I will get over to your blog as soon as I can, but have been so distracted and disorganised with my time that I’m still neglecting everybody terribly and suffering from blogger’s guilt as a consequence.